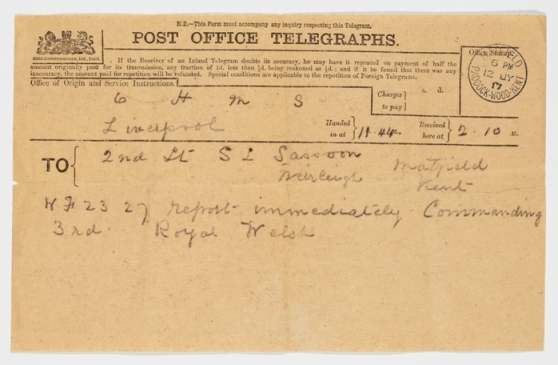 The illustration in the banner at the head of this blog is a detail taken from a tag given to Siegfried Sassoon for his voyage from France to Southampton aboard the Aberdonian on 1-2 August 1916. Sassoon had gone down with enteritis on 23 July, while his battalion was temporarily withdrawn from the front line of the Battle of the Somme. His case was severe enough to have him despatched to the 1st New Zealand Stationary Hospital in Amiens (the scene of his poem ‘Died of Wounds’), and from there to the No. 2 Red Cross Hospital in Rouen. 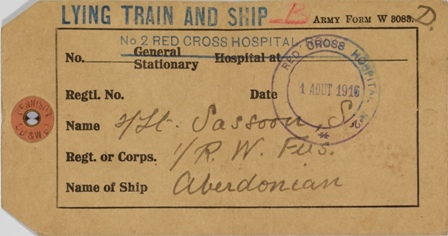 In the Memoirs of an Infantry Officer Sassoon (in the character of his alter ego George Sherston) recorded how, at the Rouen hospital, a doctor had spotted his name in a list of officers recently awarded the Military Cross, and that this lucky chance had ‘wangled’ him his evacuation back to England — thereby saving him from the hazards of further involvement in the Somme campaign. The tag was discovered folded in a pocket inside the cover of Sassoon’s diary for the period.